As you can see, the price for a major service at dealers ranges from around $5,500 to just under $9,000. Of course this pricing is for the maintenance only and does not include any other needed repairs. Do not forget that all Ferrari Dealer majors come with a 12 month warranty. The links above cover the individual items addressed during their service. For comparison, independent shops tend to run about 15-30% less than dealers. The key with independents is finding one with a solid reputation in the Ferrari community. Visit the folks at www.FerrariChat.com and ask about shops in your area. To get an idea, a basic major service performed by Eugenio’s Ferrari Service, a highly regarded independent shop in Ferrari owners circles, will cost roughly $4,000 to $6,000. The annual fluid service costs for a Ferrari 355 will cost you about $1,000 in dealer dollars. A quality independent shop will typically charge slightly less, but will be pretty close. Many times the cost of an annual is low to simply get you in the door so the car can be inspected for any other service or repair items. Oil changes in your Ferrari 355 should range from $200 to $400 depending on your dealer or independent. Many times specials are run on something as simple as this, it gets owners in the door and begins creating a service relationship with clients. If you are mechanically inclined it is something you can do yourself. An oil change kit from Ricambi runs about $60, but remember it will take almost 10 quarts of oil to refill your 355, so doing it yourself will save you some money, but not a lot. When it comes to brakes on a 355, you can always visit the Ferrari dealer and spend $900 on replacing the brake pads. If you have some mechanical skills, you can always do it at home with a high quality aftermarket brake pad for less than $200. There are a bunch of write-ups on the web with simple to follow how to’s. A full replacement of your brake system will run between $5000-6000 dollars at a dealer, for those prices you can look at higher quality, aftermarket upgrades for the same price, if not cheaper. 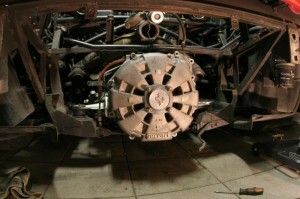 Finally, replacing the clutch on the Ferrari 355 is much easier than the 360. This is where there is a little savings between the two. Because of the placement, it is easier to access and therefore slightly cheaper. Costs from a Ferrari dealer and independent shops to replace the clutch only, range from $1600 to $2500 depending on materials. This is an “engine-in” job and you should be quoted 6-9 hours of labor for it. You can purchase new clutch and pressure plate kits for between $1000 and $1500 through Ricambi or another parts supplier and do it yourself to save some money. The Ferrari 355 has had a cluttered history in regards to maintenance costs. We sincerely hope this puts some myths to bed. Can $10,000 and up repair bills be real? Of course they can, especially for 355’s that have not been properly maintained and driven. For an idea on how these costs compare to other Ferrari vehicles visit our “The Truth about Ferrari Maintenance Costs” article. Just remember, let your Ferrari warm up to temperature before driving, change your oil, and take care of your car and it will take care of your wallet.